How do the status of points change after an order has been placed? In general, you can have a setup so that on any order, all points are initially awarded in a *Pending* status. This means the points can't actually be used unless they are changed to *Approved* status. You can have the points automatically *Approved* after an invoice is generated or the order shipped. If the order is canceled before one of these events are triggered, you can have the points associated with the order to be *Canceled* as well. If you're issuing a refund, once the points are *Approved* (after the invoice was generated or order shipped), you'd have to create a Credit Memo so that Magento can process the refund. Credit Memos are a bit more complicated because there's a lot of variables you can apply to it as a merchant. Because of all these variables (for instance partial refunds), it's not always clear how the points on the order should be adjusted. For instance if you're issuing a partial refund, how would you decide on how many points to approve or how many to revoke? Things like this have to usually be monitored by a human on a case-by-case basis. 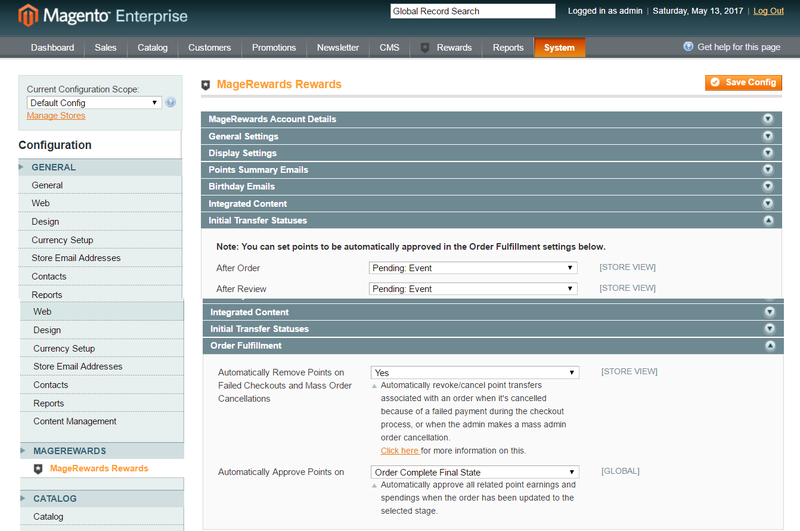 Because of this, MageRewards pops up a modal on cancel for the administrator to manually adjust points. When you're looking at an order, the points information is visible in the "Points and Rewards" section. Below is a screenshot of an example order which has had an invoice generated for it. This shows you where the points information for that order is stored and how you can manually change it in case you need to do so for any reason.